On April 7, 1972 Virginia General Assembly bill H-210 was signed into law making George Mason College independent of the University of Virginia. Among the provisions in this law was the creation of a Board of Visitors for the newly-independent and renamed George Mason University. 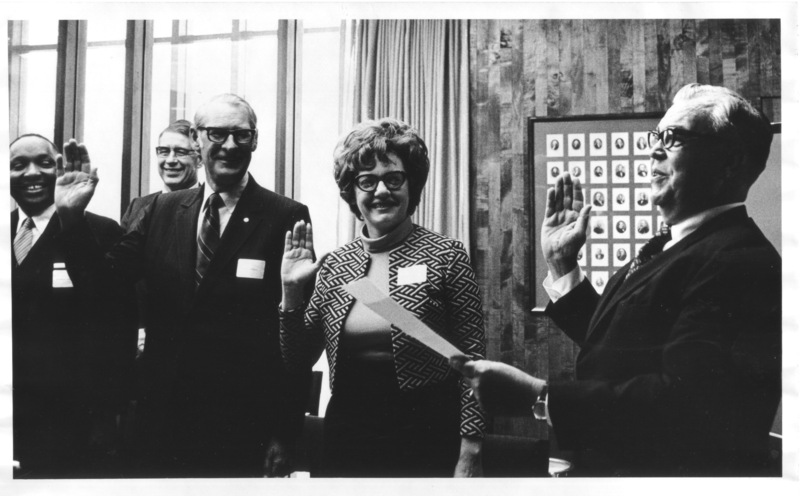 A little over a month later, on May 31, 1972, the new Board of Visitors for George Mason University met for the first time. In this meeting they would discuss and make some initial decisions on several issues, including choosing the President for the new university. Virginia Governor A. Linwood Holton, Jr. had begun to look for members for the Board of Visitors in March of that year, and by May he was still finalizing his list. All sixteen board members had been chosen in time for the May 31 meeting. Members who were already associated with Mason included: Arthur W. Arundel, owner of the local radio station WAVA and the Loudon Times-Mirror newspaper; U.S. District Court Judge, Albert V. Bryan, Jr.; Preston C. Caruthers, Chairman of the State Board of Education; John T. “Til” Hazel, a Fairfax attorney; C. Hunton Tiffany, a Fauquier County banker; former Fairfax City Mayor John C. Wood; and John J. Corson, former assistant to Secretary of Health, Education, and Welfare John Gardner. There were nine new members: educational consultant, Elias Blake; Harriet F. Bradley, former Drainsville District member of the Fairfax County Board of Supervisors; Dr. Alvin E. Conner, a Prince William County physician; Alexandria City councilman A. George Cook; William C. Frogale, a Falls Church businessman; Carol Griffee, Executive Editor of The Northern Virginia Sun newspaper; Dr. Warren J. Pace, Superintendent of the Falls Church Public School System; Lutrelle F. Parker, attorney and former County Planning Commission Chairman; and Lester G. Sturgill a Northern Virginia consulting engineer. These men and women would be sworn-in on May 31. Chancellor Lorin A. Thompson, local lawyer and university legal counsel, A. Hugo Blankingship, Jr. and the members of the Board were in attendance for inaugural meeting. Chancellor Thompson called the meeting to order at 5 pm in the Conference Room on the second floor of Fenwick Library. Decisions that would be made in this meeting would come into effect as of July 1, 1972, the date Mason officially became independent of the University of Virginia. They began by electing a rector, John C. Wood. After this decision Chancellor Thompson excused himself from the meeting, and Rector Wood assumed charge of the meeting. The Board discussed who should be appointed Mason’s first president. They recommended that Chancellor Thompson be appointed president of the university at an annual salary of $30,000. They chose Dr. Thompson because he had expertly guided Mason during its development from a community college to a 4-year college and eventually, an independent university. Given that Thompson was already 70 years old they recommended that he serve as Acting President until a proper search could be completed. After this decision, they asked Dr. Thompson to return to the meeting. They continued to discuss the budget, faculty, curriculum, and a number of other topics including a resolution to ask University of Virginia President Edgar F. Shannon to permit students graduating in June 1972 the opportunity to choose as to whether their diploma was issued from George Mason College of the University of Virginia or George Mason University. The Board set the university budget at $5.5 million for the year 1972-1973 and approved a tuition increase of twenty-five dollars per semester. They adjourned at 8pm. That evening, Chancellor Thompson released a statement announcing that Governor Holton approved the recommendation of the Board to make him the president of George Mason University. Thompson would accept this assignment because it would be a temporary appointment which would give the Board time to conduct a search for his successor. Browse items pertaining to the 1972 George Mason University Board of Visitors.